Dr. Kamal Malla Bujarbaruah, Ph.D, DSc (hanoris causa), a 1976 batch of ARS, is a distinguished agricultural scientist with an illustrious service record as Deputy Director General, ICAR, New Delhi; Director of two ICAR institutes and OSD for another; Joint Director and Scientist at ICAR Research Complex, Meghalaya and presently the Vice Chancellor of Assam Agricultural University, Jorhat, Assam has contributed immensely to the agriculture and allied sectors. 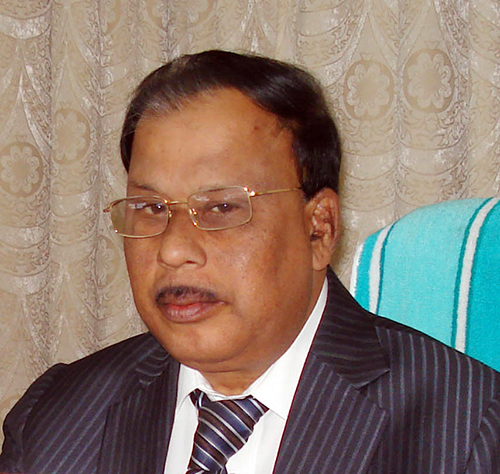 In his long service career at different places, Dr. Bujarbaruah left an indelible mark contributing to the cause of overall agricultural sciences, notable among which were conservation and utilization of crop (several rice accessions at NBPGR) and animal germplasm (mainly Mithun and Pig) for food and agriculture; development of six numbers of IFS models; initiation of research on organic agriculture, soil and water resources across the region including the state of Sikkim in a watershed approach; developing and getting developed several crop and an animal varieties; initiation of research on crop and animal biotechnology the output of some of which have been commercialized now; introduced and worked upon high-tech horticultural modules including floriculture; got implemented roof top gardening; initiated research on climate resilient agriculture; introduced e-learning facilities in the University for the first time; worked with farming community of North East in general and the state of Assam in particular demonstrating and injecting the power of technology in enhancing productivity; developed bilateral partnership with different countries on research collaboration and the likes. Dr. Bujarbaruah was also the Country Co-ordinator for FAO (Food and Agriculture Organisation, Rome, Italy) besides working as Sectorial Director for World Bank funded project. Several Awards including Best Vice Chancellor Award, 2016; Life Time Achievement Award of the Indian Society of Animal Production and Management (ISAPM), 2017; Sardar Patel Outstanding Institution Award from ICAR, 2014; 2 times Life Time Achievement Award’, Agricultural Research Leadership award of the country, 2015; DSc (hc) from Odisha University of Agriculture and Technology, 2012; N. N. Dastur Memorial Award, from National Dairy Research Institute, Karnal, Haryana; C. R. Sane Oration award from Maharashtra Animal and Fishery Science University, Mumbai; Fakhruddin Ali Ahmed Award of ICAR; ‘Prani Mitra’ Award from Blue Cross Society of India, “Food for Future” award, “Harit Ratna (Green Gem) award, 2015” for outstanding contribution on empowerment of Youth in Agriculture; “Krishak Ratna” (Farmers Gem) Award, 2015 for taking the University to farmers’ door for improved technology injection and economic benefit there from. The team, under his guidance, received Basant Rao Naik Award and 2 more Fakhruddin Ali Ahmed awards of ICAR. He is also the Fellows of prestigious national academies like NAAS & NAVS. The University, under his leadership, received country’s recognition as the Best Rice Research Centre Award (2015), Best Centre Award for Dry land Agricultural Research (2014) and Excellent Centre award for Soil Arthropod Pests Project (2017), Best Apiculture Centre, Best Seed Production Centre etc. Six of the farmers covered, under the University programmes, received the Best Farmer Award of ICAR at All India level. Dr. Bujarbaruah has around 151 research papers, 22 research bulletins, 4 books and guided 6 Ph.D and 3 Master’s degree level students besides guiding the research of around 500 scientists of ICAR and 700 faculty members at AAU. Such guidance earned the University prestigious projects like ‘Obama–Singh Award’, ‘Erasmus Mundas’ fellowship, collaborative research with national and overseas institutions. He participated in a number of national and international seminars and discussions in countries like USA, UK, France, Italy, Greece, Canada, Australia, New Zealand, Mexico, Philippines, Dubai, China, Thailand, Nepal etc.